TCBY® has always been the frozen yogurt innovator and franchise leader. And since 1981, franchises across the country have been serving delicious and nutritious frozen yogurt treats to customers of all ages. Today, millions of loyal customers have made TCBY one of the most beloved brands in the world. We've got a whole new look that's fresh, contemporary, exciting, and in perfect keeping with today's active consumer. 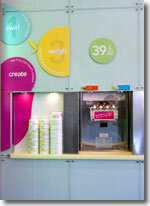 Our new look keeps TCBY leading the way in frozen yogurt franchising. Our new self-serve store platform is exactly what busy customers want, and what franchise owners need to be as efficient as possible. Franchise owners will love the ease of the self-serve platform, and the increased productivity that can help maximize profits. It's the perfect solution for today's market. With more experience than any other frozen yogurt franchise, an appealing new look, and a store model that's better for both customers and owners, TCBY has never looked better. Click on Request Information for FREE info on how to open a TCBY franchise today! Please Note: This TCBY franchise opportunity and other franchise business opportunities, businesses and franchises for sale on this web site are not to be considered as an "offering", "franchise offering", suggestion or recommendation by Franchise Leader™. This advertisement depends entirely on the truthfulness of the information provided by our advertisers which includes, but is not limited to, franchisers, franchise brokers, franchise consultants and business brokers. Franchise Leader™ recommends that you consult a lawyer, financial consultant, accountant or professional advisor before buying a franchise or business opportunity or any type of business. By using this form or any part of our website, you have agreed to all terms and conditions of Franchise Leader™. Please review our Terms & Conditions for more information.